We all know , Adobe Reader is the most widely used PDF reader application. But there are many other applications which people prefer over it because of its large loading time and its large memory consumption. 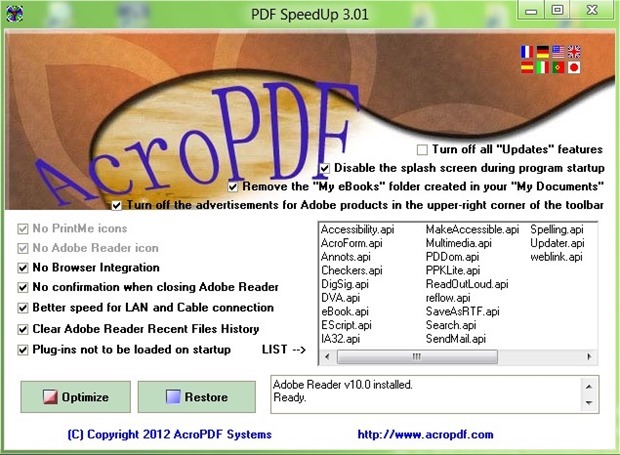 So PDF SpeedUP is a tool specially built for speeding up Adobe Acrobat Reader by turning off unwanted functions of the application to be started. For instance , it stops the update function which gets started along with the execution of Adobe Reader . You can also revert back to your original settings at any time. To get started , just download the software and install it . Now after running the exe file you will see a pop-up or start screen of the software as shown above . Just mark all the unwanted elements which you do not use (I personally will prefer to mark all) and click on optimize . You can also restore to your previous settings by running the software and clicking on Restore button. The application will show a pop-up box asking you to run the Adobe Reader application , select yes to run the application or no . i use Foxit reader which is quite fast without additional software. I always recommend it.